A disclaimer before I start; I didn’t read the entirety of this book, so if some moment of literary genius occurs at the end, forgive me. Additionally this book was provided to me, free of charge, by the author for the express purposes of a review. 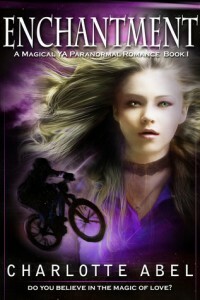 Enchantment, a YA paranormal romance, is the start of the Channie series by Charlotte Abel. The dialogue was by far the best aspect of the book, being colourful and evocative without working too hard at it (a sure sign of talent). I also liked how the characters were so casual in their use of magic, as illustrated in the first chapter by Channie’s dad, which said a lot about the world they lived in. Within the first couple of pages I’d consigned this book to the trash heap, luckily I’d already committed to reading and reviewing the book because it’s the only thing that kept me reading. By the time I’d reached the end of the first chapter I was beginning to see the good things the book had to offer but at a third of the way through I was over the constant sensing of lust, and the overuse of the word itself. The plot was repetitive and angst-ridden and I needed something more to happen than the lightning quick relationship between Channie and Josh. It was like Abel was writing the book according to topics that weren’t allowed to overlap. Where in the great wide world were the uber powerful mages who wanted to kill Channie’s family? Why couldn’t that thread have been given greater weight in the first several chapters instead of just being mentioned in the first and then forgotten? By the half-way mark I had skipped ahead to three-quarters of the way through and was rewarded with some decent writing and something different (non-romance) happening. It was refreshing and I was happy to keep reading, until the chunder worthy romance came back that is. Needless to say I didn’t finish Enchantment. What really ticked me off was the lack of bookmarked chapters in the ebook (I read the ePub version), which made it difficult to tell where I was in the story and made me wonder if it was ever going to end. I couldn’t easily skip ahead and see what was coming next, which might have inspired me to keep reading. Page 3, para 4 – really? She’s 16 and she hasn’t figured out what lust is? A half-naked boy has his hands all over her naked back and she still can’t figure it out? Give me a break. “Maybe she was getting sick.” Maybe she needs a brain replacement. The blurb makes this book sound so very good, it’s a pity the actual text doesn’t live up to the hype. As a reader it’s safe to say that I didn’t like this book. Although, after her initial brainlessness, Channie did grow a few brain cells, I never came to like her. There was too much lusting, or sensing of lust, and too little of… well anything else of any interest. Mostly I found Enchantment to be heavy on the romance with not enough of the rest of the plot, or at least not enough early enough in the book to a) keep me interested or b) assure me, as a reader, that there was more fun stuff to come. In short there was no incentive to keep reading. As a writer I’m taking inspiration from the dialogue, which was colourful and interesting and seemed to appear on the page without effort. I’m also taking the reminder that all the elements of a plot such as romance, suspense and action need to be woven in equal parts throughout the book, not just in isolated sections, lest readers like me get bored and put it down. Learn more about the book on Goodreads.